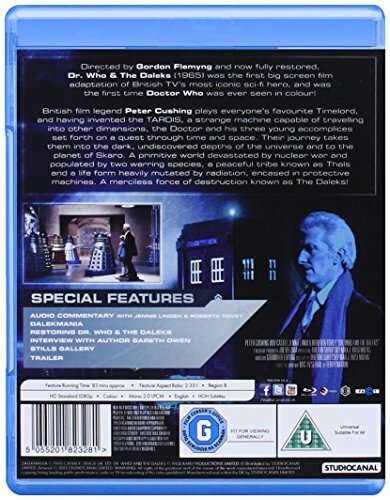 Please note this is a region B Blu-ray and will require a region B or region free Blu-ray player in order to play.Directed by Gordon Flemyng and now fully restored, Dr. Who & The Daleks (1965) was the first big screen film adaptation of British TV's most iconic sci-fi hero, and was the first time Doctor Who was ever seen in colour!British film legend Peter Cushing plays everyone's favourite Timelord, and having invented the TARDIS, a strange machine capable of travelling into other dimensions, the Doctor and his three young accomplices set forth on a quest through time and space. Their journey takes them into the dark, undiscovered depths of the universe and to the planet of Skaro. A primitive world devastated by nuclear war and populated by two warring species, a peaceful tribe known as Thals and a life form heavily mutated by radiation, encased in protective machines. A merciless force of destruction known as The Daleks!